Rendering for a gondola to connect Olympic venues in London (courtesy Expedition Engineering). Shifting Skyline. London’s famed skyline may be getting an addition, and it’s not a new building. 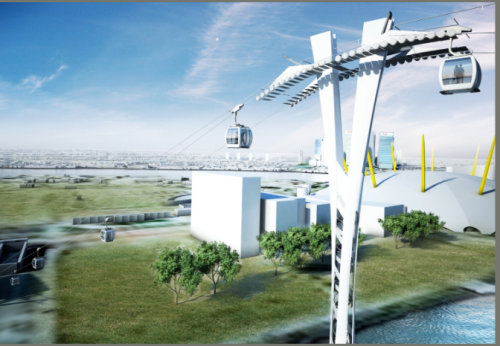 The Architect’s Journal tells us that Mayor Boris Johnson recently approved a plan by architects Wilkinson Eyre and Expedition Engineering for a proposed cable car system designed to link two key 2012 Olympic venues, the O2 Stadium and the Excel Exhibition Hall. NYC’s Youngest Landmark. The New York Times City Room blog reports that NYC has four new landmarks: the Engineer’s Club, the Neighborhood Playhouse, Greyston Gatehouse and the Japan Society, which having been completed in 1971, makes it the youngest of the city’s historic landmarked structures. Red Hook North. Meanwhile NYT Magazine reports that Red Hook developer Greg O’Connell hopes to do for tiny Mt. Morris, NY what he did for a slice of once-decrepit Brooklyn waterfront. Will the former NYPD detective’s progressive form of gentrification and downtown revitalization work in an ailing upstate town? Onion domes in Paris. Inhabitat shares the news that the Russians are coming to Paris, in the form of a new domed church and cultural center. Situated near the Eiffel Tower, this new structure is the result of bi-national collaboration from the architects at Arch-Group and Sade Sa.